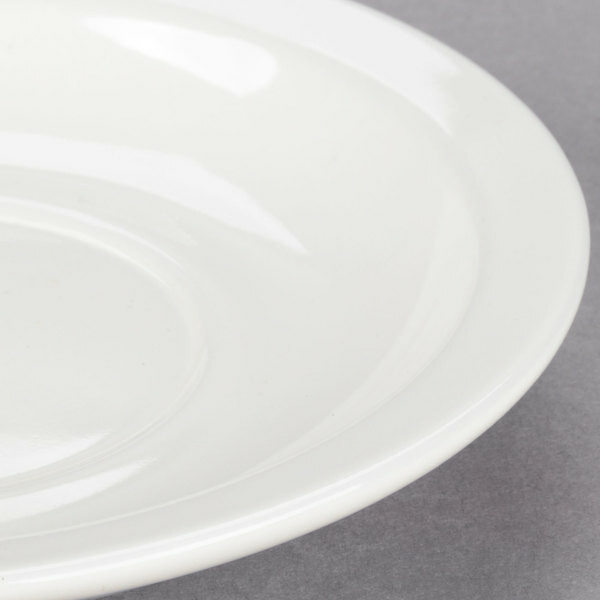 Perfect for holding cups of tea, coffee, or hot chocolate, this Choice 5 1/2" ivory (American White) narrow rim china saucer is a versatile addition to your collection. 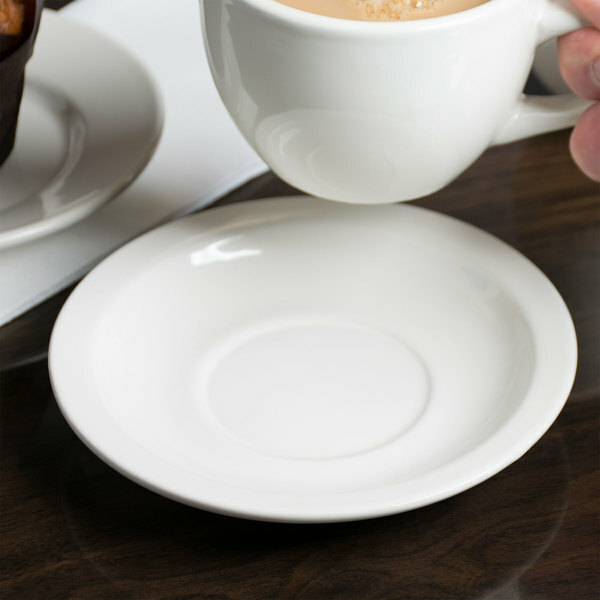 Great for a variety of uses, this saucer provides simple style and function at your restaurant, cafe, or diner. With its classic design and durability, you can serve each beverage with confidence to keep your guests coming back time and time again! "These saucers are great on their own, or pair with matching items. They add an elegant, professional look to coffee service and make things more convenient for guests. The China is heavy weight, and the ivory color is not too dark or too bright. Just right. Recommended product." 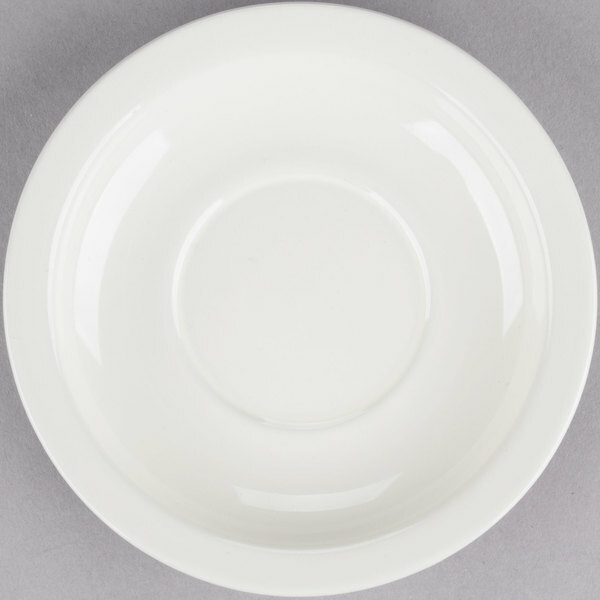 With its ivory coloring, this saucer enhances any style or color of table linens, dinnerware accessories, or table settings. The elegant color also provides a touch of sophistication to your establishment. 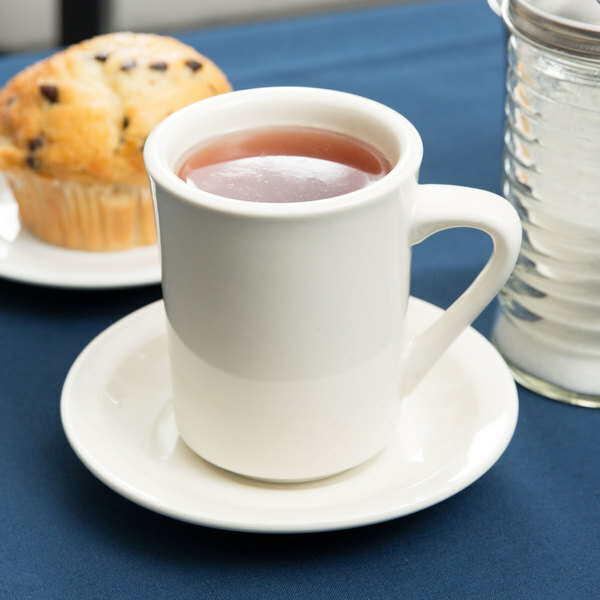 The narrow rim expertly frames muffins and pastries while the interior provides the perfect resting spot for tea cups and mugs. 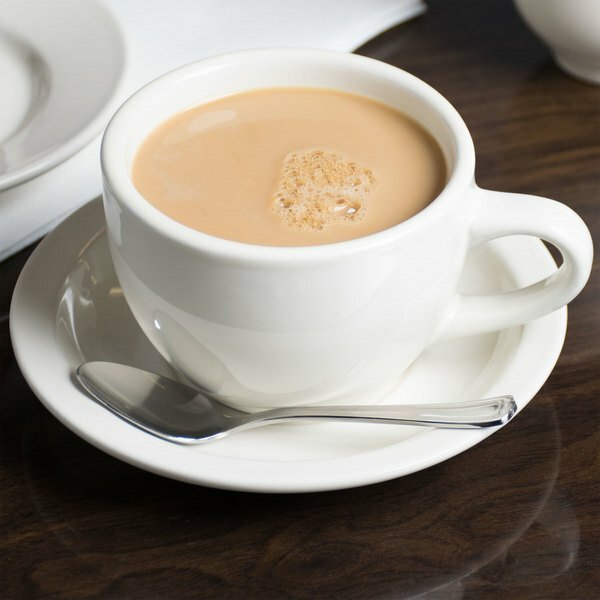 Commercial-grade china is intended for everyday use. 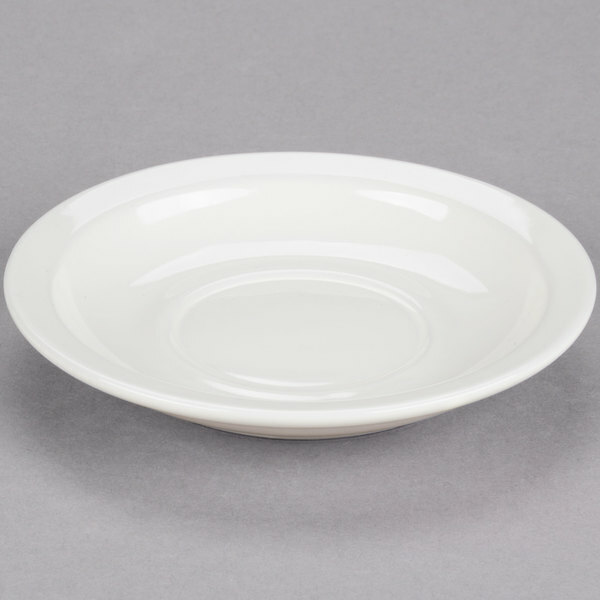 Built to withstand the demands of a busy kitchen, this saucer is a sturdy alternative to other lower-grade china. 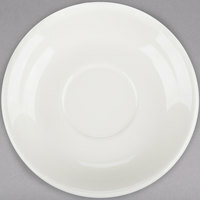 A great design for a small size saucer plate. The plates are heavy duty and perfect for serving tea to our little guests at our princess tea parties. A great clean white color. These saucers work very well with their matching cup. We use them for our coffee service and they look classy and do the job well. Will buy these again when we need more. Great saucers at a great price! ! Couldn't find anything that came close to the price locally! They are clean and b=right looking! Would buy again! I purchased these saucers to go along with the Narrow Rim China Coffee Cup. They go together perfectly. The size and weight is exactly what I expected. I felt that the items were described and presented very true to life. I was not disappointed in any way. These cups and saucers could be used for an elegant sit down dinner. Great quality and look great for my 7 onz coffee cup mugs we use for coffee, tea, cheese cake and some snacks good price great quality. These are great and they worked really well for our current cups. They are holding up well and were a good purchase and have held up nicely. Matches perfectly with the 7oz coffee cup, this makes the perfect cappuccino set and I cant wait to use in them in my coffee shop. Nice heave duty saucer. Perfect for under your coffee cup or for serving muffins. They at a nice look to our tables. They are holding up great under every day use. These saucers are great! They are very thick, so they should be able to handle a lot of abuse. They'll work great with the cups we got for our leather teacup holsters! This saucer matches perfectly with the American White (Ivory/Eggshell) Narrow Rim 7 oz. Coffee Cup. We use this set to serve our teas and coffees at the shop, which gives it a nice elegant feel. Endures washes well and hasn't stained so far. These saucers are great on their own, or pair with matching items. They add an elegant, professional look to coffee service and make things more convenient for guests. The China is heavy weight, and the ivory color is not too dark or too bright. Just right. Recommended product. Saucers work great with the mugs. It was hard finding a saucer for another mug I purchased. But these ones go with it well. We actually started using these saucers for our soup cups as well.